We characterized BBa_K649104 and BBa_K117002 in lsrR(-) strain of E.coli. Fluorescence intensity of BBa_K649104 was much higher than that of promoterless-gfp(negative control). Strain used in this assay lacks lsrR. This work is done by Takuya Tsubaki. 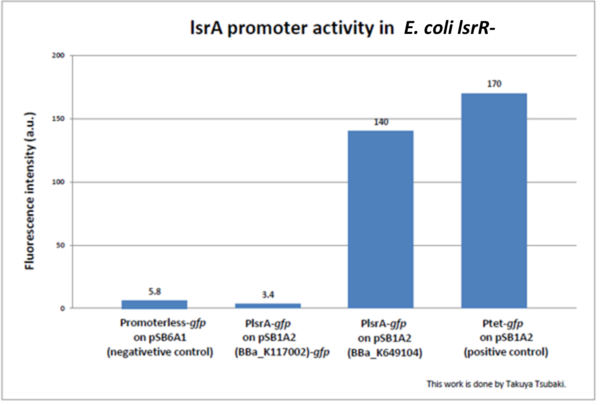 Fluorescence intensity of our lsrA promoter-gfp(BBa_K649104) was much higher than that of promoterless-gfp(negative control), showing that our new lsrA promoter(BBa_K649100) works. In spite of no LsR repression, gene transcription does not take place sufficiently. On the other hand, fluorescence intensity of lsrA promoter-gfp((BBa_K117002)-(BBa_J54103)) was almost the same as promoterless-gfp(negative control), showing that lsrA promoter(BBa_K117002) does not work properly. Gene transcription takes place sufficiently. The difference between lsrA promoter(BBa_K117002) and lsrA promoter(BBa_K649100) is whether promoter contains CRP binding site or not. Our lsrA promoter(BBa_K649100) contains this site but lsrA promoter(BBa_K117002) does not. According to Wang(2005) et al, cAMP-CRP directly binds to the upstream of promoter and stimulates expression of the lsr operon. CRP recognition sites are shown in capital letter.BBa_K649100 contains this sites. The working part we created allow the use of AI-2 as a signaling molecule, which is a very powerful tool to build complex Synthetic Biology systems. JD22597 is a strain lacking lsrR. 1.Overnight cultures of reporter strains grown at 37°C in LB medium containing appropriate antibiotics were diluted 1:100 into 3 ml of LB medium and were incubated at 37°C as fresh cultures. 2. After their OD590 reached 0.15, the fresh cultures were diluted 1:100. 3. After 4-hour incubation at 37°C, 1 ml of each culture was moved to 1.6ml tube and its fluorescence intensity was measured with a flow cytometer. After four hours from OD590 reaching 0.15, we measured OD.